Every year it's the same thing here in Southern California: The surf get's good but everything else get's cold. I know we're soft compared to you guys who are paddling and surfing in the ice and snow, dodging mini icebergs and cracking icicles off your nose hairs but, shoot, cold is cold and when it's 40 degrees on the beach here in San Diego, the best thing to do is head south. We're fortunate to have a couple escape valves. The biggest one is our southern neighbor. 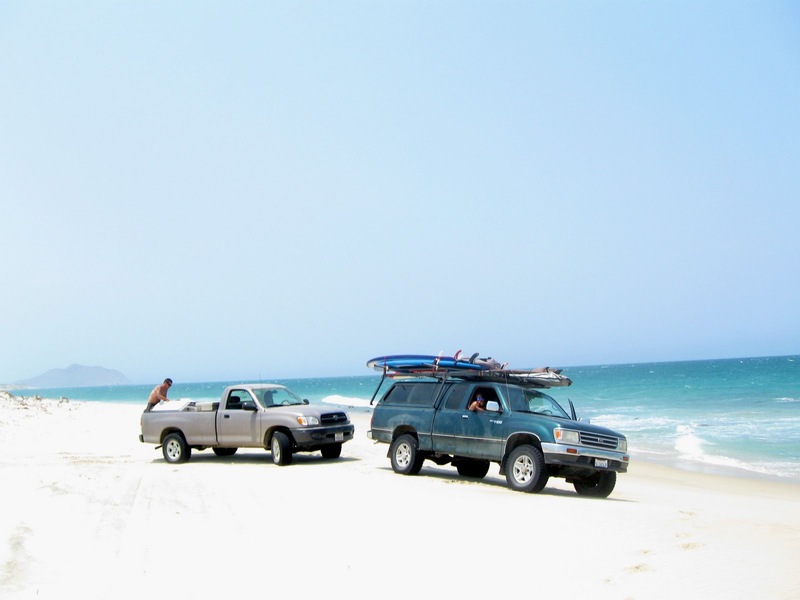 For me, Baja is just three exits down the freeway, cross the border and you are basically on another planet. The rules are different, the language is different and everything is just a touch more wild- I actually feel a little more free down there than I do here in our good old United States of America (don't get me wrong I love this country and would never trade residency. I'm just saying that all the rules, regulations, codes, paddling zones, lawsuits, nanny-state bureaucratic nonsense has really taken away some freedom from us. You don't know that until you hit a spot like deep Baja where the thinking is that if you're dumb enough to try riding a motorcycle drunker than a skunk and you run into a cow and kill yourself- it's your own damn fault. Don't even consider trying to sue the rancher.... wow, I think I just got off on a little rant). The feeling of loading up the 4x4 for a three week surf mission down past the Tropic of Cancer never get's old for me. The surf gets cleaner, the water gets clearer and, almost magically, you're back into an average daily temperature somewhere in the mid-seventies. Warm is good, and you get that in southern Baja. This year, I'm trying something a little different. I'm heading even further south down into mainland Mexico to my little surf hidey hole. The spot is one I've written about before- it's basically a goofy foot fantasy land. The wave isn't exactly a high performance dredger but it's such a long, fun ride that you don't exactly care if you're battling grannies on long boards for a couple runners. I've surfed it Spring, Summer and Fall but not in December so I'm excited to see how it looks this time of the year. The only thing cold down there are the margaritas other that it's a big, warm surf playground a few quick hours (by jet) to the south. I don't know how you guys and gals in the really cold regions stay sane- maybe you just dream and plan for the summer. For me, I look forward to Christmas Break and when that last Friday bell rings, I know what I do, I head south- maybe you should too. CD and i still want to go on a mex run with you come this summer-goofy foot paradise sounds good to us! Be safe and Feliz Navidad amigo!